Oh yes I Love allnurses.com. I'm a regular reader and occasional contributor. At work I tell my coworkers all the time to check it out. Its a wealth of information and the best networking possible! Now those glasses. Wow very cool. 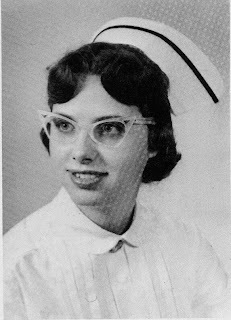 I have a pic of me when I graduated from LPN school in 1973. Yes it was similiar to your pic. We wore our white caps and I remember a thin dark green velvet ribbon that ran along the top edge. I remember wearing white stockings and skirts to work LOL. Wow the world of nursing has changed. For the better as far as dressing is concerned. Now that I work L&D I don't even have to buy scrubs. I want to thank my reader with sharp eyes for pointing out my typos in this post. Boy, do I feel silly. No wonder we can't get a date!